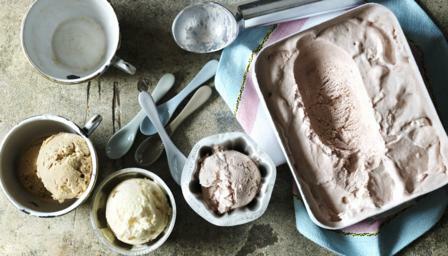 Try Mary Berry’s recipe for an easy, no-churn homemade ice cream with plenty of flavour variations to chose from. Whisk the egg whites in a large bowl until stiff peaks form when the whisk is removed. Slowly whisk in the caster sugar, then continue to whisk until the egg whites are stiff and glossy. Whisk the cream in a separate bowl until soft peaks form when the whisk is removed. Fold the cream, egg yolks and your chosen flavouring (see ingredients list) into the meringue mixture until well combined. Pour into a plastic container and freeze for at least two hours.